Dimensions 0.25 by 9 by 11 in. Amazon.com description: Product Description: Being different can be hard. Jacob is in a hurryâa really big hurryâto get to the store to buy a special toy. There's only one left, and if he doesn't get to it soon, he'll never forgive his mom and dad for making him late. Strangers often stop Jacob's parents on the street to ask about him. See, Jacob is unusual: He has an eye patch. Jacob knows people like to ask questions, but do they have to ask right now? Luckily, Jacob gets to the store in time, and he meets a new friend who has something different, too. In the end, Jacob's journey makes him more aware of other peopleâs feelings. 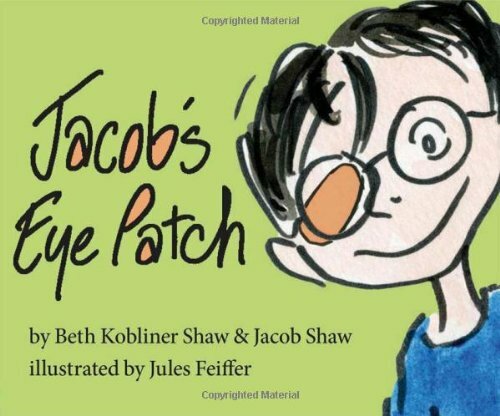 Jacob's Eye Patch is the go-to book for talking about differences that kids can enjoy and parents can turn to for guidance. Everyone has something different! Whatâs your something? Share your childâs story at JacobsEyePatch.com.